When “action!” turns into reaction as a murdered corpse is found by a film crew during a night shoot, police in Chelsea realize they have a serial killer on their hands after the cheeky villain sends cryptic old poems and famous quotations that reveal the initials of who is next on the hit list. And to top off the taunting notes, when a gutsy journalist fast-talks her way into crime scenes and catches more clues than the police, she finds herself becoming the target of dangerous suspicion on both sides as viewers, police and the members of the film crew wonder just what she'll stop at to make a name for herself in print. 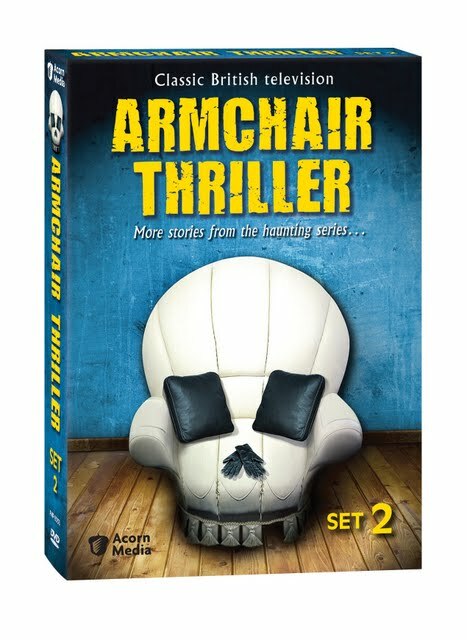 The second box set of UK Armchair Thrillers released by Acorn Media isn't quite as satisfying from start to finish as the superior first installment, but there's still plenty of twists and turns along with a chilling showdown that lives up to the series name in the final case to entertain devotees of British crime classics. Based on the novel by Lionel Davidson, the set opener “The Chelsea Murders” is actually repeated twice in two very different formats as the first two volumes of the set, which breaks down the mystery initially into the standard six episode format on the first disc before it's cut down to a far more successful feature film length on disc two, playing all the way through without the annoyance of starts and stops. And while normally cases are so jam-packed that you need the extra fifty minutes, in the case of “The Chelsea Murders,” it ratchets up the tension to such a degree that you'll forgive feeling shortchanged a mystery in a four disc set that only includes three tales instead of the traditional quartet because of the dual format combo style. Yet thankfully, any lingering annoyance you have over the duplicate thriller will most definitely vanish as you get lost in the middle mystery which finds a ruthless wife ready to seduce any man she meets to track down the stash of jewels stolen by her incarcerated husband. To this end, she works with the prison psychiatrist as her lover and accomplice to help spring her husband from the clink to find out exactly where the jewels are being held. But once the beguiling beauty garners the attention of the police officer on the case and the fall guy continues to implicate her, things start to really get interesting in this riveting contemporary version of a classic Film Noir about a woman ready and willing to use more than her feminine wiles to get what she want, romance be damned. Adapted from Desmond Cory's novel by David Hopkins -- “The Circe Complex” is a vast improvement over the compelling but dated “Chelsea Murders.” Likewise, it's hands down the set's standout as the type of British mystery that is sure to inspire writers to think a little harder to go past the obvious in the classic love triangle (or quadrangle) set-ups to hair-raising results filled with double-crosses, mistaken identities and ingenious twists. Speaking of twists, you'll almost need to break out a “Clue” game like pad to keep all of the suspects and motives straight in “Quiet as a Nun,” the fourth and final volume DVD, which culls its convent set shocker from the novel by Antonia Fraser. When television journalist Jemima Shore receives word that her childhood friend turned nun has perished, locked away on an alleged hunger strike in a tower as if she were in some medieval play, she arranges a deal with the elderly mother superior to take her holiday at the convent/school for girls under the guise she's working on a program about women in various religious faiths. Although she isn't a Catholic and sins regularly as the mistress of a married member of Parliament, Jemima is able to jump right back into her childhood spent at the school as she realizes that the nuns are filled with many more secrets than vows they've taken to serve God, which becomes apparent as all Hell breaks loose in search of the deceased nun's will, leaving more bodies and scandals in its wake. An intriguing premise combined with a naturally secretive setting of a convent, “Quiet as a Nun” which aired in the early '80s in the United States on PBS Mystery! keeps us riveted for at least half of the episodes. However, perhaps in the attempt to hurry up and tie up all of the loose ends needed to end the mystery, characters soon come out of the woodwork and it grows so increasingly confusing that you wish the episode introduction voice-over “catch-ups” would last for the rest of the episode, pointing out things we may have missed or reminding us just which nun is which. Overall, it's quite successful complete with a spine-tingling finale set in the dark that indeed pushes you to the edge of your seat. And although “Quiet As a Nun” loses you a few times along the way and would've benefited from both English subtitles and image remastering in some of the darkest visual sequences, it still surpasses the disappointing by comparison “Chelsea Murders” that uses up half of the boxed set. However, this edition of Armchair Thriller doesn't meet the expectations set by the terrific introductory set. And as such it makes me wonder if instead of the repeating tales and trio of mysteries the two sets should have been merged together as one. Yet overall, due to the strength of both “Nun” and the highlight “Circe Complex,” fans are sure to be riveted throughout, getting so absorbed in “Circe” that for a moment you believe that had another disc of installments been added to that mystery, it could've spawned into a full blown Noir miniseries.